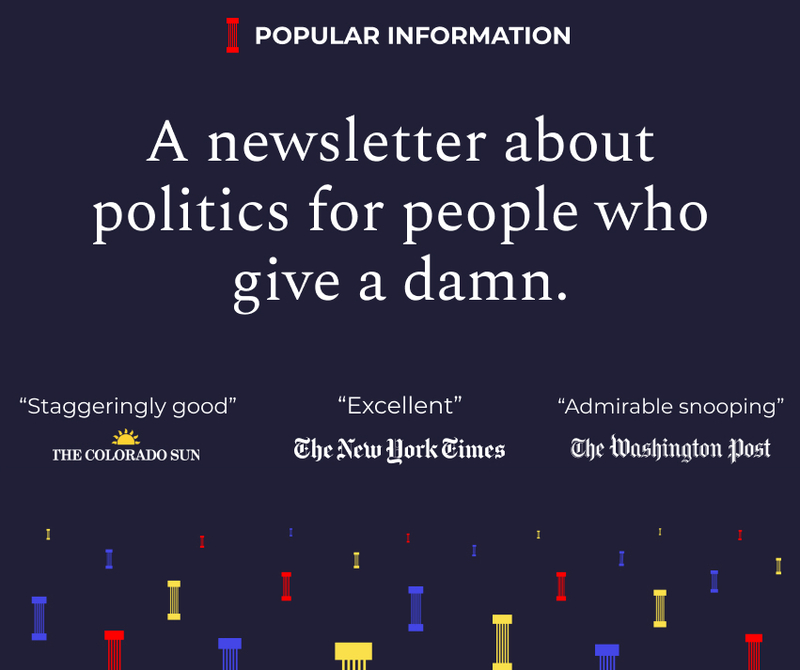 If you like Popular Information, forward it to someone who might like it too. If you’ve been forwarded this newsletter, sign up at popular.info. What is the top issue for voters headed into the 2018 midterm elections? Poll after poll after poll finds health care topping the list of voters’ concerns. Yet media coverage of the issue with just 77 days until Election Day is scant. The outcome of the 2018 election, however, will have a substantial impact on the direction of health care policy in America. Obamacare has been successful in driving down the number of Americans who are uninsured. Just 11% of Americans now lack insurance, the lowest number ever recorded (but still too high). Cost is still a problem, however. “15.5% who have insurance either skipped or delayed care because of the cost,” according to a recent study by the Kaiser Family Foundation. That means about one-quarter of Americans either lack coverage or have trouble with medical costs. Health care is a big issue because, for tens of millions of Americans, it’s a big problem. Republicans will “take another stab at repealing and replacing the Affordable Care Act if the midterm elections go their way,” Axios reported in June. If you haven’t heard about it, that’s not an accident. Obamacare repeal is very unpopular, and Republicans don’t want the word getting out. "Repeal is like fight club," a GOP operative told Axios’ Caitlin Owens. "First rule is not to talk about it." Sen. Lisa Murkowski, who provided a critical vote in 2017 against repeal, said she would reconsider her decision. According to the report, “Graham-Cassidy,” a radical plan that would repeal Obamacare and end Medicaid as we know it, remains the leading policy option. If Graham-Cassidy became law, around 32 million people would lose their insurance coverage once it was fully implemented. Having failed at fully repealing Obamacare, the Trump administration has quietly been doing anything it can to undermine the law. The first step was the repeal of the individual mandate, the requirement that all Americans obtain health insurance, which was included as a sweetener to Trump’s tax legislation. The administration has also taken “actions to expand the availability of plans that are exempt from various Affordable Care Act (ACA) requirements.” This includes exploiting a loophole for “short-term” plans that don’t meet the basic requirements of health insurance under Obamacare. Under a new rule, people will be able to enroll in these “short-term” plans, which can exclude maternity care, prescription drugs, and people with preexisting conditions, for up to three years. A similar move by the Trump administration would make it easier for small businesses to offer “association” health insurance plans, which are also exempt from Obamacare requirements. The result, and perhaps the purpose, of these moves, is to drive up prices in the Obamacare marketplace. They siphon healthy people from the exchanges, making the average person more expensive to insure and raising prices. The Brookings Institution estimates, absent the Trump administration’s efforts to sabotage Obamacare, premiums would decline 4.3% in 2019. Instead, premiums are poised to increase across the country -- in some cases by as much as 30%. If Democrats gain control of one or both houses of Congress, they will have increased leverage to curb further attempts at sabotage. If the status quo prevails, the Republicans are likely to accelerate their efforts. It’s not just the federal elections that can impact health policy. Plenty of governors and state legislatures are up for grabs and states can have a real impact in reining in health care costs -- even if Trump continues his current approach. In New Jersey, for example, Democrats control the state government and implemented an individual mandate. By expanding the pool in the state health care market, the state was able to keep prices down. Health insurers in New Jersey requested an average increase for 2019 of 5.8%. Without an individual mandate, the state says, the increase would have been 12.6%. The outcome of the 2018 election will determine whether more states will be able to follow New Jersey’s lead. Another reason why state elections matter: Medicaid expansion. Under Obamacare, states can opt into expanding Medicaid to residents who earn up to 138% of the federal poverty level. Although the federal government absorbs almost all of the costs, many states still have not opted in. This has more to do with Republicans’ reflective opposition to anything associated with Obamacare than any genuine policy concerns. The results can be dramatic. Louisiana expanded Medicaid in 2015 and in two years saw their population of uninsured adults cut in half. The home care program would be funded by a new 3.8% tax on income above $128,000. This is the income level where the government stops the collection of Social Security taxes. A recent poll found 51% of Mainers support the measure, while just 31% oppose. None of this will be easy. The pharmaceutical industry is quietly working to make sure that, after the 2018 election, Obamacare is crippled or repealed. The Pharmaceutical Research and Manufacturers of America, better known as PhRMA, is funneling millions to the American Action Network (AAN), a dark money group dedicated to electing Republicans. A full repeal of Obamacare would be worth $28 billion to the pharmaceutical industry over 10 years. Its exact donations in 2018 are unknown due to the lag in public filings. Prisoners across the country will go on strike Tuesday, protesting meager pay and poor living conditions. Prisoners in at least 17 states are expected to not report to their jobs. The strike is backed by the Industrial Workers of the World (IWW), a radical union. It’s being coordinated by the Incarcerated Workers Organizing Committee, a division of the IWW. Other workers are paid just pennies an hour or, in some states, nothing. The strike is scheduled to last until September 9. “The goal is not to hold out and win negotiations with officials, but to last those 19 days and punch the issue to the top of the political consciousness and agenda,” the Incarcerated Workers Organizing Committee explained in a pamphlet promoting the strike. The Trump administration is attempting to manipulate the 2020 Census by discouraging immigrants from being counted. Last December, the Justice Department wrote the Department of Commerce requesting that the 2020 Census add a question asking participants if they are citizens. The move is widely seen as an effort to discourage immigrants from participating. Since Congressional districts are apportioned based on the results of the census, it could shift power from urban centers, which tend to vote for Democrats, to rural areas, which favor Republicans. The plan has hit a snag in federal court. The State of California sued the Trump administration, arguing that the question violates the census procedures prescribed in the Constitution. On Friday, a federal court rejected the administration’s motion to dismiss the suit, meaning that the judge believes California has a legitimate claim and a chance to win on the merits. If California prevails, it will thwart the administration’s plans to add the citizenship question. Stay tuned.